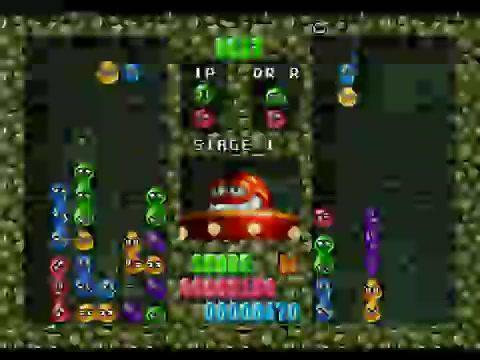 Not bad for a Puyo Puyo western debut. Sonic had just established his first flush of success here in the video game world at the time. His first two games had become run-away hits that really spiked the competition against Nintendo. Sega decided to release a puzzle game to feature for the Sega Genesis. What they did is that they combined the video game Puyo Puyo, a puzzle game never released outside of Japan due to religious reasons, and characters from the Sonic the Hedgehog cartoon. The result? 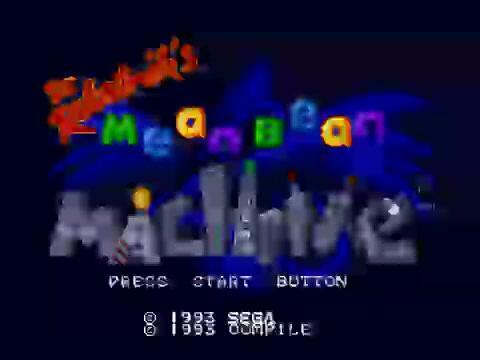 Dr. Robotnik's Mean Bean Machine. The story is that Dr. Robotnik (a.k.a. Dr. Eggman) has built a machine that robotizes the puyo puyos (or "beans") in order to "stamp out music and fun from Mobius forever." You may notice right away that Sonic and Tails do not make an appearance in this game. So who's the protagonist? You! You have to compete against Eggman's goons and stop the evil doctor from proceeding with his plans! How you go about that process is simple: arrange the beans, two at a time, to their corresponding colors. If four or more connect, they disappear! If you make a combo, unconnectable clear beans will fall in the opponent's playfield. 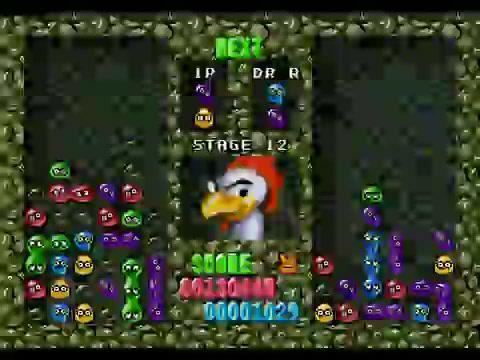 The more combos, the more clear beans will fall until the opponent's playfield is covered, defeating the opponent. You can play by yourself, with another player, or with the computer. In story mode, you have to fight 12 robots, some familiar to the cartoon, before you can face Eggman. The playfields are like rocky dungeons, and you see the robot's face, either neutral, happy, or sad, depending on the situation. It gets bland after a while, but that shouldn't detract from the gameplay. The beans are funny-looking, though, and the intros are pretty good. The music can also sound bland at times, considering its typical Genesis flair, but it picks up after you beat a good deal of the robots. Some of the music you hear are slight remixes of the music you hear from Puyo Puyo. All in all, this is a good taste to the Puyo Puyo series Personally, I prefer Kirby's Avalanche compared to this one when it comes to graphics, but this one has slight better music. If you're looking for a game for starters or one where you can play with your buddies, try this game out for size. Just don't let the CPU's tenacity overwhelm you.